Despite a high chance of rain, our friends and clients came out for a fun afternoon here at SODO-Moto. From Kei Vans to Autozams, the variety of cars and owners was something to see. After hanging out at the shop and enjoying some coffee and pastries, we embarked on a cruise to Alki Beach. Although the days are getting shorter, and the temperatures colder, we hope to have more events like this in the future. Stay posted and check out Facebook page for updates! Well, it certainly has been a busy few weeks here at the shop! The first thing to let people know is that our good friend Asael no longer works here. We will miss his smiling face and wish him luck in his new endeavors. We have a couple of new people here (both customers of the shop) who are working with us now. Brent (AZ-1 owner) brings with him a great deal of experience working on vehicles and computer knowledge and Felix (a Subaru Sambar owner) who may lack experience (he is only 20), but brings with him an enthusiasm that only someone his age can bring. Lots of new items coming in early the week of 08/21/2017 on the GREENWICH BRIDGE V.099E – Will be a few days before we get the container cleared and unloaded but look forward to having these in-hand. Happy to receive a report from our vanning agent that the two Nissan Saurus and the Morgan plus 8 are loaded and ready to sail 08/23 on the GUANG DONG BRIDGE 019E. This shipment include some other odds and ends picked up on recent trips to Japan – track-tires for Mazda AZ1 / AZ1 KYB shocks / Williams International gas-turbine engine / Honda HA3 – Acty van parts… Should arrive in Tacoma first week in September. Well, it was a busy couple of days what with getting 15 new vehicles in from the port and getting everything ready for our Grand Opening last Saturday. I would like to thank everyone who came out to support us – good to see old friends and we made a bunch of new ones, too which is always great. I’ll be posting pics of all of the vehicles we have in inventory and will be updating the vehicles we sold so please keep checking back. And, again, call or come by anytime you like! Grand Opening Saturday the July, 15th! As you guys may have seen we will be having our Grand Opening this Saturday, July 15th. We hope all new and former customers will come and help us celebrate. We will be closed either Wednesday or Thursday of this week to pick up quite few new vehicles from the port. 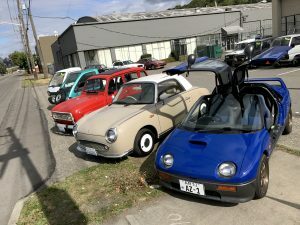 Coming we will be having several little micro vans and trucks, a Nissan Pao, three Mitsubishi Delica’s, a four-door diesel Mitsubishi Pajero, a Toyota Townace, a Daihatsu Midget – well, that’s just to name a few.